USRC maintained their impressive form in 2018 winning their 6th game in a row as they took out an under strength Goodfellas team 4-0 at Kings Park. Starting 2018 with a draw against Forward the Gunners have racked up an impressive 19 out of a possible 21 points in 2018 and goals from Steve Cairns, Mark Jobling, Charlie Short and an OG saw them move into 2nd place. USRC took the lead with a well worked goal and a tidy finish at the near post from Cairns but it could have been a different game had Fella's capitalized from a great chance on the hour mark but the volley was smashed over the bar. USRC doubled their lead from a fortunate OG with the 3rd and 4th coming quickly after. Forward remained unbeaten in the league through 19 games but would feel this was 2 points dropped against a Tropics team who dug in and defended well capitalizing on some complacency from their opponents with two late goals. Setting up in a 5-3-2 formation, Tropics were happy to conceded a lot of possession to Forward out wide but kept the middle compact and dealt with the Forward crosses quite easily. Forward did however find a way through after about 20 / 25min when Habib Bah Spiller hit a shot from 18 yards through a sea of players into the bottom corner and the leagues top scorer Kaffi Harun made it 2-0 into the second half. Forward took their foot of the gas and stopped closing down and pressing the play allowing Tropics to come back into it and a dubious penalty 5 min from time was converted by James Manning and in the last minute a John Rammage glancing header brought it back to 2-2. 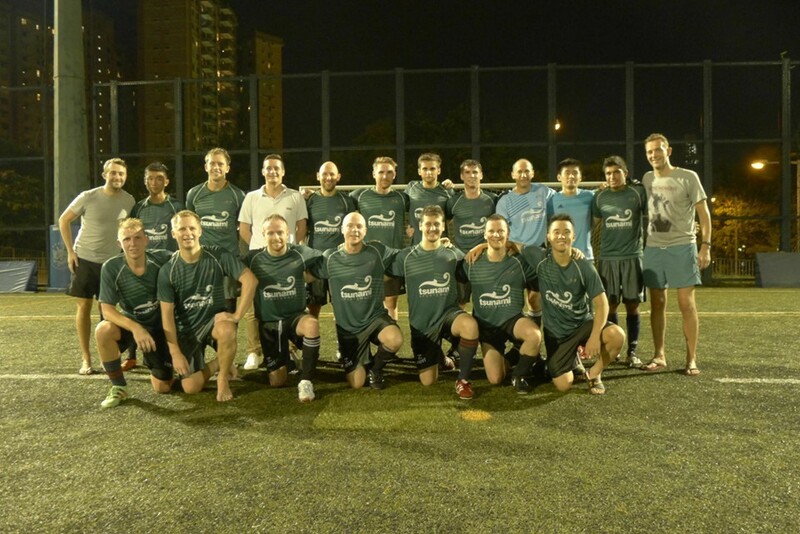 San P's continue to fight for their survival in Division 1 with a 1-0 victory over the stuttering HK Scottish Stags. An early Charlie Clack goals was enough to bring home the 3 points and although Stags dominated possession they were unable to break down a solid San P's backline. The result brings the water boys level with Corinthians on 19 points but with Cors having played a game less and San P's still to play DB and Forward it's still an uphill challenge. Corinthians picked up a crucial 3 points as they also fight for their survival beating Spartans 1-0. Not the best performance from the men in red but a solid and strong defensive display from Cors brought home the bacon. Unconfirmed reports that Manj messaged Cairnsey after the match thanking him for his words of wisdom a few weeks back regarding the defenders and what they would need to do to stay in the league. Manuel Crespo netting the winner. J-Leaguers have had an up and down 2018 and have struggled to get momentum but this wasn't an issue as they ran out 4-1 winners against Mes. Tomoo Takahashi, Shochi Arai, Masayuki Sakai and Yuji Hirano netted for the men from the rising sun to ensure their Saki tasted sweet on Sat night while Mes only had a Chris De Leglesia (pen) to show for their efforts. In Division Two Bants recorded a tough 1 nil win over Revo at Aberdeen Sports Ground to continue their pursuit of the league title. The game was locked 0-0 before Stefano Sorrentino finished a superb heat seeking cross from Sam Ameen to give his team the win. In the other Saturday game in Division Two Samurai Blue recorded a high scoring 4-2 win over Team Shot Gun. A good flowing game as usual with lots of back and forth mentioned Samurai manager Kais after the game. The first four goals came from corners with defender Nathan Smith getting behind one as both teams seemed cancel each other out. Couple of times Shotgun took the lead but we managed to get the equaliser right away before we got ahead 3-2 from a superb break said manager Kais with a Ahmed Jemli goal. Less than 2 min later Shotgun came close to equalising from a penalty but the shooter missed the goals and the game remained 3-2. Shotgun continued their efforts to get the equaliser but Samuari managed to put it to bed after Peio Burucoa scoring the fourth from nice team work. Kings Park on the Monday night saw Soho Spartans continued to chase Bants heals with a tough 4-2 win over KCC Cavaliers. League top marksman Li Yongsen and Nick Dashti scored early to give Spartans the lead. However KCC responded well to score a goal before half time and then another one after. However Spartans side responded well with Willie Wong and Robbie Lunn getting on score sheet to secure the vital win. In the other result KCC Royals suffered a 2-1 loss to Hong Kong Vikings who recorded their first win for some time after leading the competition for much of 2017. The game was scoreless at halftime before KCC Royals opened up with 1-0 lead from ever reliable veteran Paul McGunnigle. However the Vikings hit back with two unanswered goals from Kristian Soe to secure Vikings first win of 2018. In Division Three Shui Wei scored a vital 2-0 win over BOCs to keep their hopes of claiming the title off Young Guns alive. In a close game which BOCs failing to convert their chances which proved costly said losing manager Chi Man. Shui Wei rode their luck and scored a dubious offside goal firstly from John Xuan before sealing the win with a breakaway goal at the end from Chester Xu. In other games MBFC suffered a 1-nil loss to TWF to a penalty from an unintentional handball in the box. TWF scorer Wai Lee made no mistake to hand his team the win. While The Shooters scored another resurgent 2-1 win this time over Legal Head. The first half was scoreless with Legal Head opening the scoring from Phil Bliss amazing diving header. However Shooters Hiroshi Uehara scored both goals with 10 minutes to go, who played energetic pressing game despite Legal Head having a lot of possession.